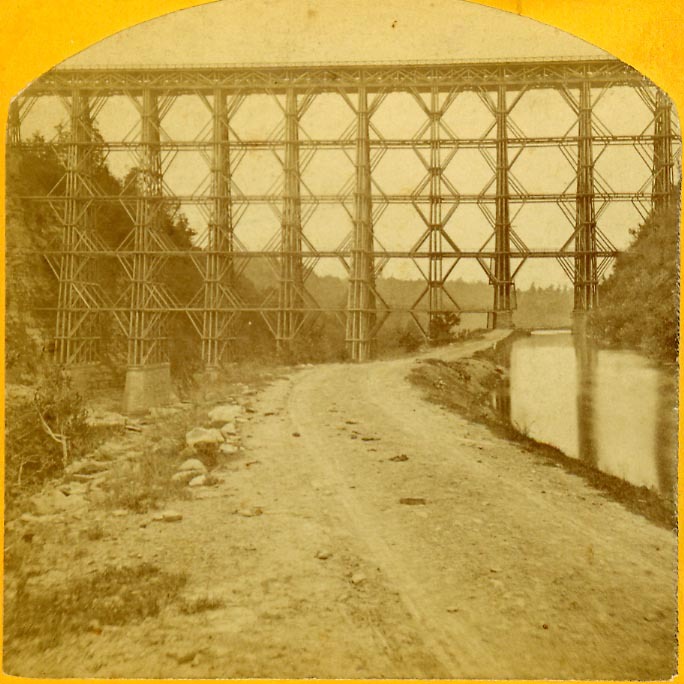 "634.- Sectional View of Portage High Bridge"
The photographer set up his equipment on the side of the towpath of the Genesee Valley Canal when he took this image sometime around 1870. The Genesee Valley Canal is to the right in the image, the Genesee River is over the bank to the left. Note the wagon tracks - this part of the canal was a public highway. Passing under the Bridge the traveler could veer off on a small road that would take them across the lattice bridge at the top of Middle Falls. The image shows the south side of the Portage wooden bridge. In the enlarged view below you can see a roof line of a small building between the third and fourth tower (counting right to left). This may be another view of the building seen in Image 5.